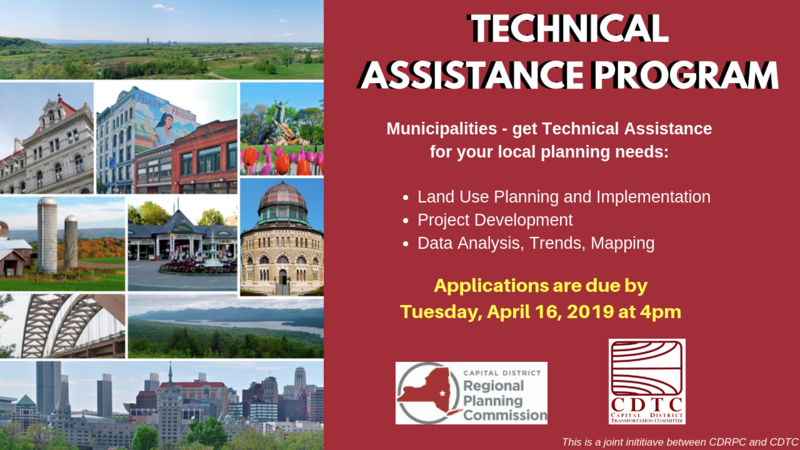 The Capital District Regional Planning Commission’s (CDRPC) 2019 Community Planning Technical Assistance Program, with support from CDTC, is intended to offer staff time and expertise to local governments undertaking small scale community planning initiatives that resonate with the principles of CDTC’s New Visions 2040 Regional Transportation Plan. 2019 Applications are due by Tuesday, April 16, 2019 at 4 p.m. If your community is interested in receiving services under this program, you must contact CDRPC prior to applying to discuss your request. Send an email to techassist@CDRPC.org and provide your name, phone number and a time convenient for representatives to call you.